Apollo 9 astronaut and Lunar Module Pilot Rusty Schweickart paid a visit to the Lunar Orbiter Image Recovery (LOIRP) facility in Building 596 (aka “McMoon’s) at NASA Ames Research Park today. 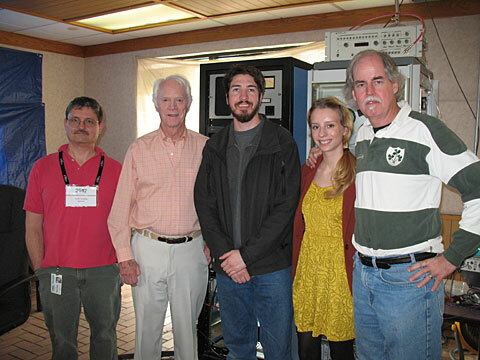 Pictured (L to R) Keith Cowing, LOIRP-co-lead, Rusty Schweikart, Austin Epps LOIRP, Neulyn Moss LOIRP, and Dennis Wingo, LOIRP co-lead. Luna 24 landed on the northwestern rim of a 64 m diameter impact crater, on the volcanic plains of Mare Crisium. Enlargement of lander at lower left, NAC M174868307L [NASA/GSFC/Arizona State University]. Three Soviet missions (Luna 16, Luna 20, and Luna 24) successfully collected and returned pieces of the lunar surface. Before the successful Luna 24 sample return mission in August 1976, Luna 23 was sent two years earlier (November 1974) to nearly the same location in Mare Crisium, but was unsuccessful. Luna 24 landed in Mare Crisium on 18 August 1976 to complete the unfinished mission of Luna 23. The landing sites of Luna 23 and 24 are only 2.3 km apart. The region of Mare Crisium where they landed is a typical smooth mare surface with little relief in the immediate vicinity. There are numerous secondary craters scattered across the region, and Luna 24 landed on the edge of one of these. The secondary craters are the result of an impact to the northeast of the landing site, perhaps from the crater Giordano Bruno. The Apollo 12 landing site in Oceanus Procellarum imaged during the second LRO low-altitude campaign. Image width is 225 m, NAC Image M175428601R [NASA/GSFC/Arizona State University]. The LRO mission continues to collect observations that are enabling ground-breaking new scientific discoveries about the Moon. As geologists, whenever we look at remotely sensed data collected from another planet, in a sense we are staring back in time. But this is the “deep time” of geology, where we are trying to understand natural processes that (at least on the Moon, anyway) could have happened billions of years ago. But the LRO mission is unique because we can also see human history. Not just any history, either, but one of humanity’s greatest accomplishments, our first steps on another world. Twelve astronauts explored the lunar surface, directly seeing things with their own eyes, making observations, and collecting samples with their own hands. These samples and observations revolutionized our understanding of our solar system. This “snapshot in time” effect is especially evident at the Apollo 12 landing site in Oceanus Procellarum, now known as Statio Cognitum. Here, you can see the remnants of not one, but two missions to the Moon. Astronauts Pete Conrad and Alan Bean demonstrated that a precision lunar landing with the Apollo system was possible, enabling all of the targeted landings that followed. Bean and Conrad collected rock samples and made field observations, which resulted in key discoveries about lunar geology. They also collected and returned components from the nearby US Surveyor 3 spacecraft, which landed at this site almost two and half years previously, providing important information to engineers about the how materials survive in the lunar environment. LROC’s best look yet at the Apollo 11 Landing site. The remnants of Armstrong and Aldrin’s historic first steps on the surface are seen as dark paths around the Lunar Module (LM), Lunar Ranging RetroReflector (LRRR) and Passive Seismic Experiment Package (PSEP), as well as leading to and from Little West crater. LROC M175124932R [NASA/GSFC/Arizona State University]. This image of the Apollo 11 landing site captured from just 24 km (15 miles) above the surface provides LRO’s best look yet at humanity’s first venture to another world. When Neil Armstrong took his famous first steps onto the lunar surface, he kicked around the soil. “Yes, the surface is fine and powdery.” Gazing at the flat horizon, he took in the view. “Isn’t that something! Magnificent sight out here.” After collecting a contingency sample Neil looked around and observed, “it has a stark beauty all its own. It’s like much of the high desert of the United States. It’s different, but it’s very pretty out here.” A few minutes later Buzz Aldrin descended the ladder and joined Neil on the surface of the Moon! The Apollo 15 Lunar Module (LM) Falcon set down on the Hadley plains (26.132*N, 3.634*E) a mere 2 kilometers from Hadley Rille. The goals: sample the basalts that compose the mare deposit, explore a lunar rille for the first time, and search for ancient crustal rocks. Additionally, Dave Scott and Jim Irwin deployed the third Apollo Lunar Surface Experiments Package (ALSEP) and unveiled the first Lunar Roving Vehicle (LRV). The ALSEP consisted of several experiments that were powered by a Radioisotope Thermoelectric Generator (RTG) and sent back valuable scientific data to the Earth for over six years after the astronauts left. This new LROC NAC image taken from low altitude shows the hardware and tracks in even more detail. The LRV, a lunar “dune buggy”, allowed the astronauts to traverse far from the LM and explore much more local geology than the astronauts on previous missions (Apollo 11, 12, 14). Not only did the LRV allow the astronauts to move from place-to-place at a lively rate of eight to sixteen kilometers per hour (five to ten miles per hour), but the LRV also allowed brief periods of rest that in turn helped to conserve oxygen. The LRV wheels were 82 centimeters (32 inches) in diameter, and 23 centimeters (9 inches) wide. Typically LROC NAC pixels are about 50 centimeters square, so it is not always easy to pick out the LRV tracks. In previous LROC images, the LRV tracks are usually only visible near the LM where the descent engine exhaust plume disturbed the surface. The LRV wheels broke through the changed surface and thus the tracks have more contrast near the LM. For two one-month periods last year (2011), the LRO orbit was lowered such that overflights of the Apollo sites were only 25 to 30 kilometers, rather than the usual 50 kilometers. These low passes resulted in NAC pixel scales near 25 centimeters! LRO has a ground speed of a bit over 1600 meters (5249 feet) per second, and the shortest NAC exposure time is 0.34 millseconds, so images taken from this low altitude are smeared down track a bit. However, the smear is hardly noticeable and features at the Apollo sites definitely come into sharper focus. In this new low-altitude NAC image of the LRV, tracks are visible about half of the time, usually when the tracks are at an angle to the Sun direction, rather than parallel.